There’s a storm brewing on the horizon, a FIRESTORM! 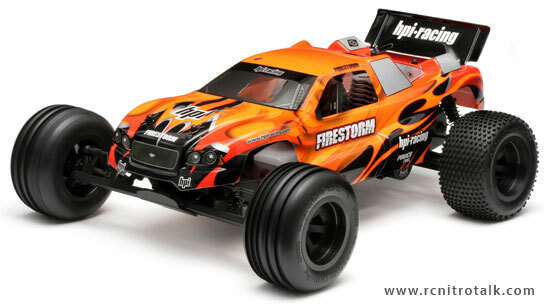 Introducing the HPI Firestorm 2WD RTR stadium truck! This amazing 2WD stadium truck features all-new design specifications, cool racing attributes and a fresh direction for HPI’s high quality entry level nitro truck line-up! Using the knowledge gained designing and engineering trucks such as the Savage and Hellfire, HPI was able to incorporate the toughness and reliability of those lines into a smaller and faster package on the power front, the HPI Firestorm 10T includes the new G3.0 engine with pullstart and an aluminum tuned pipe for maximum performance, speed and reliability. Putting all of that power to the ground is not a problem with the fully adjustable suspension featuring all-new geometry, vertically adjustable front and rear camber links, adjustable shock positions, silicone oil filled shocks with threaded shock bodies, adjustable wheel base, adjustable rear toe-in and anti-squat. All of the adjustability built into the HPI Firestorm 10T makes a truck that is already fun to drive even more fun by giving the driver the ability to dial the truck into driving conditions. All of these features are tied into the sturdy dual deck chassis featuring a thick 3mm aluminum main deck that serves as the backbone, combined with a tough steel center brace to maintain consistent gear mesh between the spur gear and clutch bellâ€¦ even on the hardest of landings. Keeping the center of gravity low was a priority so the Firestorm was designed with a lay down steering servo and a low profile 75cc fuel tank with an internal fuel filter to help protect the engine. Keeping the radio equipment safe is a sealed radio box that protects the receiver and battery and features a new routing system to protect the wiring harness. 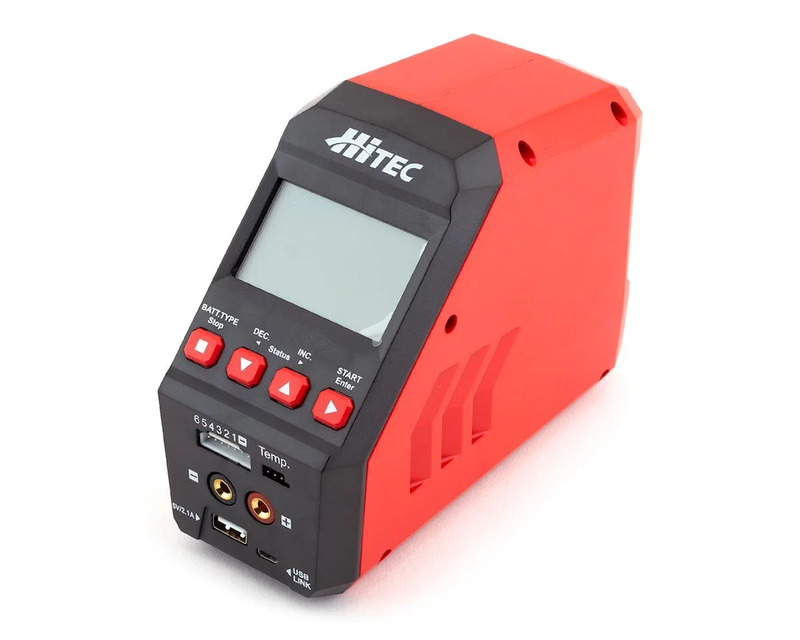 The radio box features a convenient position for the on/off switch, and even has room for a five cell receiver battery should you choose. Hooking all of this power to the suspension is a durable low profile gearbox that uses a low 4.11:1 gear ratio, a sealed and tunable planetary gear differential, a dual pad slipper clutch, and all-metal internal gears, making for a super tough and durable drivetrain. Traction is handled by new Ground Assault tapered pin rear tires and Front Line ribbed front tires for multi-surface handling and long life. Customizing the HPI Firestorm will be easy with front and rear 12mm hubs allowing you to use the same wheels front and back. Also included in the package is the new DSX-1 fully painted body with custom graphics and adjustable height body mounts. The HPI RTR Firestorm 10T has it all: speed, handling, value and great looksâ€¦ all in a convenient ready-to-run package that gets you on the track quickly. Steel front and rear axles and dogbones. Fiber brake disk with piston actuation. 16 high efficiency ball bearings. Adjustable turnbuckles at camber and steering rod positions. High quality dual stage air filter. M 0.8 pitch spur and clutch bell. 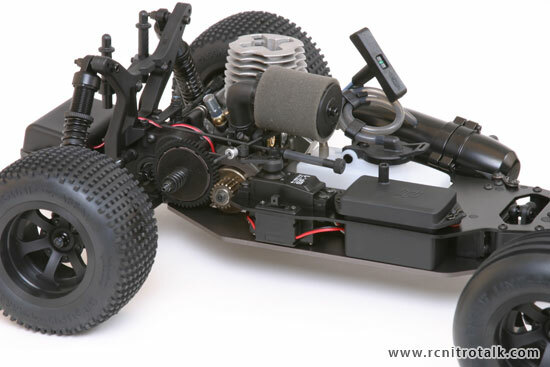 Discuss the new HPI Firestorm 10T in our Stadium Truck forum!